This paper describes a framework for “Robo-iku” (education facilitated by robots) at the kindergarten and primary school levels. We believe the concept of Robo-iku can help to give a unified approach to the problem of the avoidance of science and technology learning. It can also provide young children with opportunities to develop various skills, such as cooperative skills and/or skills to help them relate well to others. 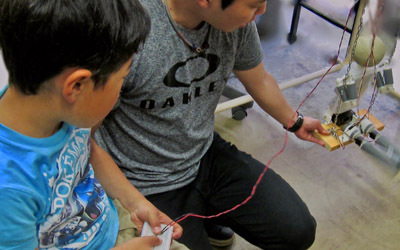 We detail the practical experience of a “monotsukuri” workshop for primary school children, a workshop on designing and building rescue robots. A working definition of “Robo-iku” is provided. The results of the workshop imply that the concept of Robo-iku needs to be further investigated. K. Kawada and M. Ito, “Study on Assist Education of Swing Riding Using a Robot,” J. Robot. Mechatron., Vol.29, No.6, pp. 999-1004, 2017. Ministry of Education, Culture, Sports, Science and Technology, “Elementary Courses of Study,” Tokyo Shoseki Co., Ltd., 2008 (in Japanese). M. Polanyi, “The Tacit Dimension,” The University of Chicago Press, 1983. M. Polanyi, “Knowing and being,” University of Chicago Press, 1969. W. Spong, “The Swing Up Control Problem for the Acrobot,” IEEE Control Systems Magazine, Vol.15, pp. 49-55, 1995. S. Takashima, “Robots Playing Sports : Gymnast Robots,” J. of the Japan Society of Mechanical Engineers, Vol.95, No.888, pp. 1010-1012, 1992 (in Japanese). H. Okazaki, Y. Kanai, M. Ogata, K. Hasegawa, K. Ishii, and M. Imai, “Toward Understanding Pedagogical Relationship in Human-Robot Interaction,” J. of Robotics and Mechatronics, Vol.28, No.1, pp. 69-78, 2016. A. Bandura, “Psychological Modeling: Conflicting Theories,” Transaction Publishers, 1974. A. Bandura, “Social Learning Theory,” Prentice Hall, 1977. J. Piaget, “The role of action in the development of thinking,” Knowledge and Development, Springer US, pp. 17-42, 1977. K. Kawada, M. Nagamatsu, and T. Yamamoto, “An Approach to Rescue Robot Workshops for Kindergarten and Primary School Children,” J. of Robotics and Mechatronics, Vol.25, No.3, pp. 521-528, 2013. K. Kawada, “Development of Educational Material to Motivation of Picking Up Rubbishes for Elementary School Students,” IEEJ Trans. on Electronics, Information and Systems, Vol.137-C, No.1, pp. 76-81, 2017 (in Japanese). T. Yokoi, K. Shibukawa, and M. Ae, “Body Segment Parameters of Japanese Children,” Japanese J. of Physical Education, Vol.31, No.1, pp. 53-66, 1986. M. Banzi, “Getting Started with Arduino,” O’Reilly Media Inc., 2011. S. Campbell, J. P. Chancelier, and R. Nikoukhah, “Modeling and Simulation in Scilab/Scicos,” Springer, 2005.